Designed for heavy arc welding. Designed to perform all other welding processes with optional add-on modules. Engineered for low maintenance in harsh environments. Performing outstanding results on stainless, or steel castings. Power sources, rated for 100% duty cycle. Amperage range adjustable in 5 amp increments. Designed with Harsh Environment in mind. Designed with a single Transformer on the MV1500G1. Powder Coated for a long lasting durable paint job. 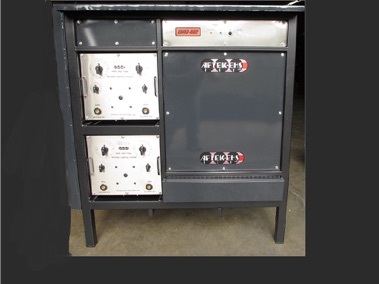 Protected with Thermostatically controlled alarms on the Rectifiers and the Transformers. Designed to shut down if any of the Alarms are Energized. Also designed with an easy-to-reset overload breaker for circuit protection. Also available with optional protection for incoming Primary Power. Dimensions 51” Wide x 40” Deep x 57” Tall.